◆ We took a real vacation recently. Two years of planning took us to France with our dear Canadian friends. It was to celebrate our mutual 30th. We returned refreshed and full of ideas! I can tell you what you already know – the food…oh the food! 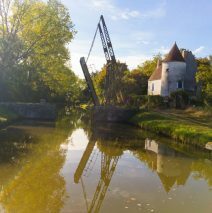 We rented a boat and navigated it down the canal for ten days stopping in the small towns along the way, picking up local foods – cheeses, meats, pates, butter, veggies, baguettes, croissant, pastries . . . and then the wines! Vacations really need to be tax deductible under the therapycategory. If this sort of vacation appeals to you, look up Locaboat http://locaboat.com/or Le Boat tours. Highly recommended, not $$$. ◆ Flying over North Carolina recently, nothing appeared amiss. The terrain was green green green – something you notice when you live in New Mexico. But no visible overflowing hog or chicken operations. A little closer to ground level, however, the picture changes markedly. Rick Dove, of the Waterkeeper Alliance, lives in NC. From small planes, he’s been monitoring the billions of gallons of untreated animal waste overflowing across the state since Hurricane Florence struck. Dove wrote about what he’s seen in the Washington Post: “I’m a Marine vet who did two tours in Vietnam, but the devastation I’ve witnessed here still shocks and grieves me. The 2.2 million hogs in one NC County alone produce twice as much manure as the waste produced by the entire New York City metro area—and not one ounce goes to a sewer plant.” North Carolina is also a favorite location for industrial chicken farms Dove writes: “I also saw how the industrial chicken production facilities had flooded…washing the waste from their floors down our streams. I didn’t see the corpses of animals, though I knew they were inside. As we speak, companies like Costco are looking to expand industrial meat production, not curb it. And while Costco has its sights set on Nebraska, not North Carolina, the damage to Nebraska’s already impaired waterways will be just as devastating.” Factory farms must go. They are ruinous on so many levels – the waterways and aqua life, the air we breathe, as well as the collective conscience. No one really wants the sustained suffering of animals. What can we do?Avoid the big producers like Jenny-O and Tyson. Choose meat produced by local farmers who use ecologically protective methods – like Berry Ranch, LaMont’s Buffalo, Shepherd’s lamb and many other of our wonderful farms and ranches. ◆ Events: Coming soon is our annual fund-raiser for the Listening Horse Therapeutic Riding Program. It will be in early November – more on that later. Then of course Joe’s will be busy preparing Thanksgiving To Gofor those who have chosen not to do all the work themselves this year. We will have the menus and order charts printed for you in early November. ◆ Watch him work. Richard Eeds broadcasts theRichard Eeds Show live from Joe’s each 1stFriday of the monthfrom 1-5pm on Hutton 1260 AM KTRC. Richard knows everyone in New Mexico – and that is not hyperbole! He keeps us abreast of all the New Mexico happenings. ◆ A Tuesday night tradition at Joe’s – Spaghetti and Chianti Night. $34 for two will get you Caesar Salad, Spaghetti with homemade Bolognese and a ½ ltr of great Chianti. Wadda deal! The Bolognese sauce is made with our grass-fed-and-finished Berry Ranch beef. Comment by Roland and Sheila: I cannot tell you how happy this makes us. We have been reporting on the dastardly deeds of this greedy power-drunk mega corporation for many years. It’s death-grip on both ends of our food supply is criminal and egregious. ◆ I’m lazy. I admit it. And staying fit and healthy takes a lot of work. So anything that makes it easier, faster, more efficient – I’m all for. For some time I have been sharing with my wellness studio clients my personal favorite formula for maintaining or building strength – slow motion, perfect form, low reps with high resistance and very short duration. I have found it to be the most efficient and safest way to build strength, keep bone density, activate the central nervous system for a cascade of biological benefits. I first discovered it through chatting with Fred Hahn about his SlowBurnfitness facilities in NYC. It just made sense to me and after buying his book and following his program for at least a year, I was very happy with the strength I was building with shamefully little time and effort. Another proponent of this type of strength training is Doug McGuff MD. His book Body by Scienceillustrates his SuperSlow exercise program. These modalities most succinct description would be – high intensity short duration slow motion resistance training. And the results are brilliant. Users of these methods are throwing away their walkers and canes. Recovery time is given great importance with users find they are spacing their work-outs further apart. Typically 5, 7, even occasionally 14 days apart. See why it appeals to lazy me?! And this is one of the reasons the bioDensity program is so appealing. A recent finding reports that falls by the elderlyis now the number one cause of emergency room visits. Not auto accidents, not cardiac arrests, not drug OD’s. And why is this? Loss of functional strength. Sarcopenia (muscle loss through atrophy) once only in the over 60 crowd, has begun now in 20 and 30 year-olds. And it starts largely due to lifestyle choices – sitting and crap food. But there is a solution. And believe it or not, it doesn’t take hours in a sweaty gym. You can always choose to sweat it out in a gym 3 or 4 times a week. Nothing wrong with that. But it’s good to know you can achieve even better results and faster with far less time. High intensity is a phrase that need not scare you. A good high intensity program is safe, slow and is typically as little as 5, 7, up to 15 minutes duration once a week. You CAN be lazy and fit! Look up Slow Burn (Fred Hahn), Super Slow (Doug McGuff), www.bioDensity.com, www.dancingbones.us. the (GMO) seeds to planting, fertilizing, processing and shipping. We as consumers just cannot hand over the entire stewardship of our food to these few multinationals. Our passion here at Joe’s is for a local sustainable food supply – food produced by growers who are accountable for what they grow. KYG – Know Your Grower. We are able to look our local farmer in the eye and ask him about his growing practices or even visit his operation. This gives us the confidence that we are eating food that is healthy,wholesome, non-genetically engineered, often better than organic, humanely treated and minimally processed. It is grown with a smaller energy-use footprint and transported short distances. We cannot divorce human health, the economy, ecology, personal (perhaps spiritual) satisfaction or honorable work from food. Food is fundamental. What we eat, where it comes from, the stewardship of food animals, the nurturing and building of soils – all these factors affect us at a cellular and visceral level. Santa Fe is fortunate to have one of the very best Farmers Markets in the nation. Here at Joe’s we offer this bounty to you, keeping dollars in the community. In the interest of transparency, in 2008 Joe’s spent $30,000 on local foods. Each year that expenditure has grown. We currently far exceed $100,000 per annum (well over 30% of our food purchases). Land, economy, health – inseparable.